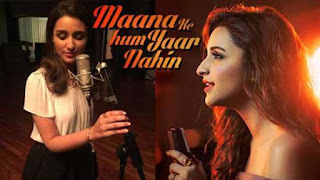 Maana Ke Hum Yaar Nahin Song Lyrics from movie Meri Pyaari Bindu (2017): Meri Pyaari Bindu (2017) is a upcoming Bollywood Hindi Hindi romantic comedy film written, directed, and produced by Akshay Roy. It starring Ayushmann Khurrana and Parineeti Chopra in the lead roles. The song is sung by Parineeti Chopra and composer of the song is Sachin-Jigar while lyrics are penned by Kausar Munir.